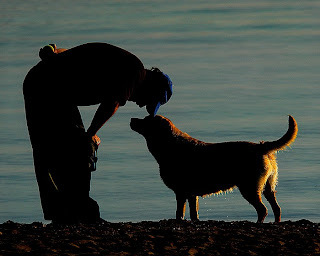 The general view of dogs is as intimate human companions, and the bond between owner and dog is very strong indeed. The importance of this can usefully be considered on a biological basis: people treat dogs for most of the time as humans, and dogs reciprocate by accepting humans as their masters and companions. This attitude can be attributed to their wolf ancestry as highly social pack animals; the social nature has been reinforced during domestication so that dogs integrate into a human family as if it were their own pack. People interpret much canine communication in human rather than dog terms and believe they understand them, even if this is not always true. Dogs are indeed highly expressive, and their social language is correctly interpreted by their owners on sufficient occasions to reinforce the bond. In turn, dogs are able to understand people well enough to obey simple commands and behave in an adaptable manner which suits the particular owner. Therefore, even if the languages are different, there is sufficient common ground for communication to function. Being social species, both man and dog are highly responsive to language cues, and these form the basis for the strong bond between the two. While companionship is the main reason people give for owning a dog, another reason admitted or inferred is the benefit to self-esteem. The common saying that an owner looks like his dog may seem a little far fetched and not readily provable or disprovable. What is more certain is that some owners use their dog as a projection of their own personalities, whether consciously or unconsciously. Undoubtedly some owners will buy an elegant dog, such as an Afghan Hound or a Shih Tzu, to reflect elegance in themselves, and others will purchase a Bulldog or Dobermann to portray resolution or pugnacity. For others, the self-esteem factor is much less obvious or important, but exists nevertheless and can be regarded as a source of strength from owning a dog. This is most evident with blind owners of guide dogs. Studies have found that blind owners claim an increase in social contacts and a heightening of their status with the normal sighted through dog ownership, and that they derive as much benefit from this as from the practical guiding by the dog. The manner in which a dog can facilitate a conversation between the owner and a stranger has been called the 'social lubricant' effect and has been investigated in the ordinary dog owner. Dr Peter Messent studied owners who walked the same route through a London park, once with and once without their dog, scoring the reactions of passers-by. Without the dog, the subjects were ignored, but accompanied by their dog people often looked at dog and owner, sometimes patting the dog and, on a few occasions, even speaking to the owner. Such friendly behavior would never occur without the dog. The ability of the dog to act as an ice breaker with others can be very important for single people, especially the elderly. A Swedish survey found that seventy-nine per cent of owners in the case of city dwellers believed that their dogs had been instrumental in establishing friendships, the figure dropping to fifty-two per cent for country dwellers. In a study in Britain on the personality of dog owners versus non-owners, Dr James Serpell's most significant finding was that female dog owners considered themselves more attractive than did female non-owners. The fact that other people responded to them when they, interacted with them. A close relationship with the dog is today perpetuated in pictures as faithfully as in ancient sculptures and frescoes Trusted and trusting, the dog has become part of the human family and often takes the place of a child As a go-between, the dog can break down any social barriers and initiate new and lasting friendships were accompanied by their dogs was probably interpreted as a greater attractiveness in themselves, an interpretation which in itself constitutes one component of self-esteem. It is interesting that the same effect was not noted in male dog-owners, a reflection perhaps of the present male-dominated society. Society can influence people's attitude to dogs. This becomes evident when comparing dog owners in cities with those in urban areas. While the level of dog ownership is higher in the country, it is the city dwellers who generally demonstrate a closer relationship with their dogs. Country dwellers may adopt a more utilitarian viewpoint, with the dog being one of several types of animals with which they co-exist. For the city dweller, the dog may represent almost the only near-human link with the animal world.